– This is an incredible surge in the cost of short-term financing as of Tuesday Morning May 29, 2018. Italy 2 Year Bond Yields now through the US for the first time since November 2014. Populists Surging in the Polls, Can You Wonder Why??? As you can see above, Italy’s raw deal on the Euro is an open wound – it can’t be swept under the rug for much longer. It’s an #ItalyFirst moment indeed. A recent poll for the daily La Repubblica put support for the Trump-like Populist League (or Lega) at close to 22 percent, up from 17 percent in March, which would make it Italy’s second most popular party. Support for the League’s (Lega) largest rival, 5Star, stayed steady at 33 percent, while support for the incumbent center-left Democratic Party dropped from 19 percent to 18 percent. Bottom line, populists now control 55% of the vote – Euroskeptic sentiment is on the rise. Lega Leader Salvini told a rally near Bergamo in northern Italy late on Saturday (Bloomberg reported). We believe the Salvini’s (Lega) surge in popularity is on par with Trump’s rise in 2016. If the Lega star was a stock, you would want to be long of it. Sunday evening, the leaders of the Five Star Movement were already discussing Mr. Mattarella’s impeachment, while Matteo Salvini, the leader of the League, who would not budge on his choice for a eurosceptic economics minister, and who has seen his popularity rise during the tortuous negotiations, is eager to go to early (new) elections. Populists in Italy (Lega – 5Star) calling for the quick deportation of an estimated 500,000 immigrants (Sky News) from Italy, with $2.4T of debts and $2.0T of economic output, they question the financial sustainability of EU migration policy? The cost of default protection on Italy’s bonds is climbing the most since dark days of the European debt crisis. Political uncertainty has unearthed risks inside the financial system of the southern European nation. The five-year Italian credit default swap rose about 42 basis points last week, the most since 2012, according to data compiled by Bloomberg. Populist leaders abandoned their attempt to form a government at the weekend after the president rejected their choice of a euro-skeptic finance minister, while Moody’s placed the country’s ratings on review Friday for a possible downgrade. Highly in need of friendly (wide open) capital markets, Italy needs easy access to financing. If the beast inside the market continues to turn on Italy, this will place Mario Draghi’s ECB in a very difficult spot. 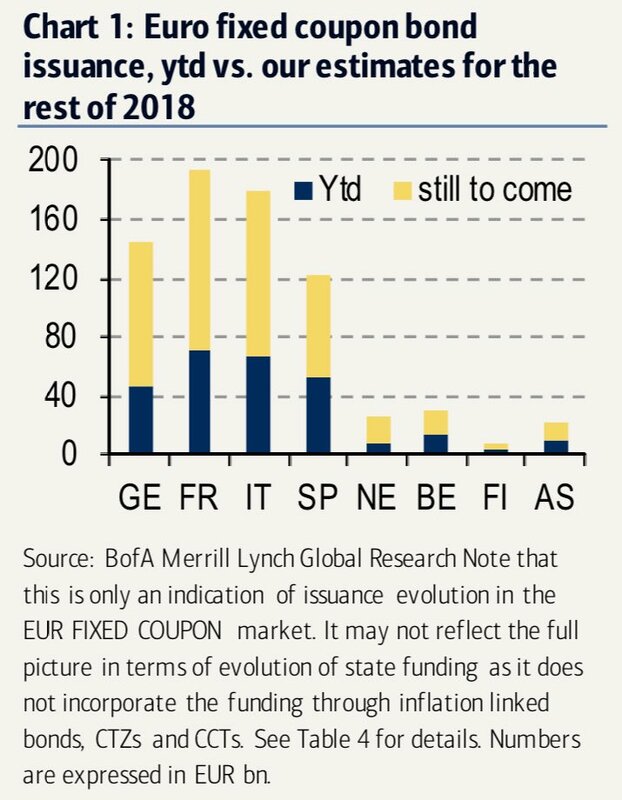 Italy still needs to sell bonds worth $130B in the markets this year, according to BofAML. This figure will ONLY increase if populists get their way on an aggressive fiscal spending plan with tax cuts. 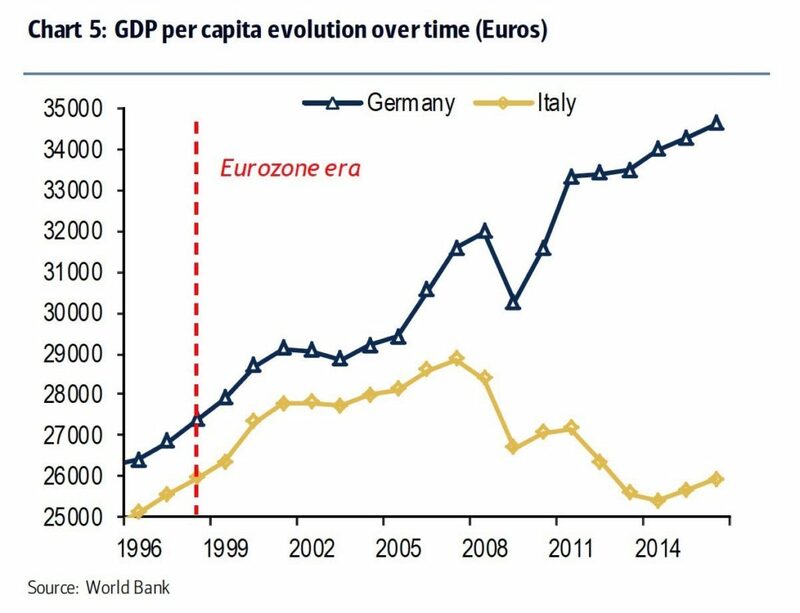 We MUST remember, there are rules within the ECB’s “capital key.” The central bank cannot purchase large amounts of Italian debt relative to other EU countries. These capital key limits will be stretched to high-stress levels in the coming months. Draghi will need a sign off from Germany on additional capital key expansion for Italy. ” Angela, please get out the checkbook.” The rise of “Germany First” populists in Deutschland presents political stress on the other side. The AfD party has surged from 1% to 18% since 2013. Populists in German (Afd) and Italy (Lega) both have their hands on a very large rubber band and they’re walking backward at an accelerated rate. According to Article 92 of Italian Constitution, it is the president who appoints ministers “following PM’s proposals,” (Lega wants Savona in a large way). * Savona, a company executive and former industry minister, has come under fire both for repeatedly calling on the government to plan for a possible euro exit and for his criticism of what he sees as German dominance of Europe. Mattarella, a former constitutional court judge, insists on his right to appoint government ministers, without pressure from outsiders. In our view, we’re looking at a Savona moment. If the new Italian government agrees with populists (Lega – 5Star) and chooses him as finance minister, it substantially raises the probability of a destructive EU conflict with Italy. It would be gasoline on the “risk-off” fire. If EU pressure prevents the populist agenda from moving forward, it will lead to a large surge in the polls for Lega – 5Star in the next round of elections (coming this year). That’s bad news for markets as political pressure on the ECB is surging to it’s highest level in years. So, Draghi (ECB) expands the capital key / bond buying mechanism for Italy? And the others?? Politics is driving asset prices here. After months of House delay in sending a Dodd-Frank regulatory relief bill to the President’s desk, President Trump signed the legislation this week. As you can see above, KRE Regional Bank ETF has been pricing in the good news for months. The bill is identical to the version which passed the Senate in March and provides relief aimed at community banks, while raising the systemically-important financial institution (SIFI) threshold from $50 billion to $250 billion (although the Federal Reserve may still subject banks between $100-250 billion for enhanced supervision). Among other provisions, mortgages held by banks with under $10 billion in assets are automatically designated as “Qualified Mortgages,” and community banks which underwrite fewer than 500 mortgages a year will be largely exempt from Dodd-Frank mortgage rules. The amended law also provides regulatory relief for appraisal requirements in rural areas, as well as broader relief to community banks in having to furnish Home Mortgage Disclosure Act (HMDA) data and lengthens the examination cycle for well-capitalized banks from 1 year to 18 months. – ACG Analytics. Mr. Di Maio and Mr. Salvini presented the coalition’s Prime Minister (PM) pick to the President this week. The candidate, Giuseppe Conte, a law professor, is without governing experience. By selecting a political novice for the premiership, Di Maio and Salvini improved their chances of exerting influence on the likely future PM. The coalition program plans to bolster the country’s spending by killing pension reform, introducing a flat tax, and by increasing expenditure on maritime migrant interception programs. While the major points of controversy were scrapped from the final proposal (the final version does not mention leaving the eurozone, or a plan to get bonds purchased as part of the ECB’s QE program), potentially fiscally worrisome measures remain. Italy’s 50 Year Bond plunged 12 points last week. In October 2016, ‘Italy’s $5.6 Billion Sale of 50-Year Bonds Beats Peers’. Italy sold five billion euros ($5.6 billion) of the securities, exceeding deals by Spain and France for similar-maturity bonds. The country became the latest in Europe to issue super-long bonds, following debt agencies in Belgium, France, Ireland and Spain taking advantage of historically low-interest rates made possible by the European Central Bank’s 1.7 trillion-euro stimulus program. 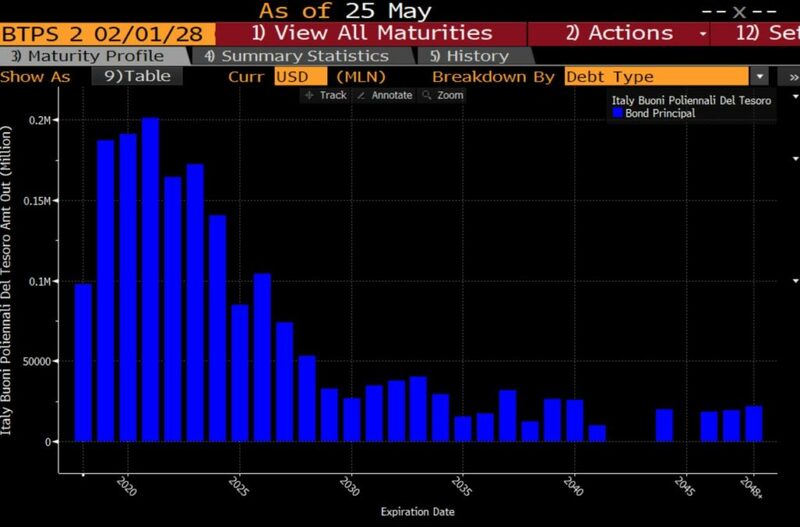 The ECB, whose asset purchases were expected to run to at least March 2018 (now at least March 2019), has acquired more than 900 billion euros of debt just from the Italian, Spanish and French governments. Political risk continues to fuel market volatility and uncertainty in the sovereign bond market, especially with regard to, short-term security issuance aimed at covering the state suppliers and tax rebates–which, if implemented, could cost the Italian taxpayers more than 5% of the Italian GDP. Equities in Italy are approaching key technical levels. Moody’s says the key drivers for the placement are the significant risk of a material weakening in Italy’s fiscal strength and the chance that the structural reform effort stalls. Italy’s long-term and short-term foreign-currency bond and deposit ceilings remain unchanged at Aa2 and P-1, respectively. “What’s the point of going to vote if it’s the ratings agencies that decide?” Luigi Di Maio, head of Five Star said Sunday in frustration. He believed financial stress in markets played a roll in the veto of their proposed Finance Minister Paolo Savona. The coalition agreement is not a legally binding treaty—the two populist heavyweights could resort to resuscitating the more radical among the scrapped measures in the future. Even though the coalition partners left out of their final program some more drastic measures, there was an original proposal which contained a draft to explore ways of leaving the euro (as well as recommended ECB debt jubilee, or forgiveness). Calling for the new government to stick to a responsible budgetary policy, the vice-president of the European Commission, Valdis Dombrovskis, noted that Italy’s borrowing was proportionally the highest of any euro-zone state except Greece. Regime Change: Eurozone Equity Market Vol Crosses the U.S.
For the first time in a year, we’re seeing the cost of equity volatility protection in Europe surge through that of the U.S. This is impressive since this year’s (White House trade and Fed interest rate) drama in equity markets has been U.S. centric. This speaks to a regime change in risk management to a more Europe leading focus moving forward. In the 2010-12 period, for months European credit risk moved well ahead of U.S. equity volatility. A solid leading risk indicator indeed. A Back Away from High Drama, for Now? The program has already inflicted High Drama on EU member states, especially within the eurozone. While M5S and Lega claim that the mini-BoTs proposal is not a veiled attempt at introducing a shadow parallel currency, many seem to doubt the honesty of their intentions. We witnessed this dangerous political gamesmanship during the early stages of the Greece crisis in 2010. When tensions are high, populist politicians in some cases leak sensitive parts of their agenda. Almost as a trial balloon, they are testing both the markets and EU political leadership’s reaction process. EXPECT A LOT MORE OF THIS TO COME. The Di Maio-Salvini-Mattarella meeting will provide clarity on the new M5S-Lega administration, and reveal details on the coalition’s future program. It is not certain that the new government will actually move to implement all of the policies enumerated in the contract. With a small majority in parliament, it will be very difficult for the future government to pass radical legislation. Furthermore, President Mattarella retains the right to veto proposals. Deutsche Bank bailout rumors, falling PMIs (economic data), Populism in Italy and government stability problems in Spain have all taken the Euro down to 1.16 from 1.25. Spain’s opposition socialist party has filed a no-confidence motion against the prime minister, Mariano Rajoy, a day after his governing People’s party was found to have benefited from an illegal kickbacks-for-contracts scheme. The new cabinet could be sworn in before the end of this week. The process would be finalized by a vote of confidence in both the Senate and the Chamber of Deputies. ACG Analytics does not believe that a M5S-Lega government can survive for a full term—the arrangement is likely to have a limited shelf-life, as the notable policy differences between the two parties and inevitable backstage influence of Berlusconi’s Forward Italy party on Lega is certain to exacerbate the tension between them. Prime Minister nominee Conte served on the Board of Directors of the Italian Space Agency as a legal consultant to the Rome Chamber of Commerce, and as a supervisory board member to a number of insurance companies going through bankruptcy. Italy two year bonds, moving from -0.32% in early May to +0.48% this week. We witnessed the largest yield spread differential between Italy and Spain in over 5 years. Systemic risk is on the rise. “Parallel currency”: The new government plans to launch mini-BoTs, controversial securities similar to a parallel currency, as part of the administration’s plan to ramp up expenditure. These short-term securities would be used to pay overdue tax rebates and state suppliers. Flat tax and universal income: The Lega made its flat tax policy for companies and individuals a part of the contract, with two tax brackets at 15% and 20%. The M5S inserted its basic income plan into the program, proposing a EUR 780 monthly compensation paid to those with no revenue. EU policy: A number of measures introduced calling for the renegotiation of EU treaties and the EU’s economic regulation on several issues, including the single currency. Both parties pledged to tackle smuggling networks and illegal migration, calling for a new debate in Brussels on European migration. Furthermore, the program calls the immediate withdrawal of sanctions against the Russian Federation. Pension reform: The program envisions the gradual scaling back of the “Fornero” pension reform. Sovereigntist economy policy: The program aims to implement a legal minimum wage (not yet specified), ramp up savings protection, increase the responsibility of banking authorities, prevent the sale of Alitalia, and re-negotiate the Turin-Lyon high-speed railway project.